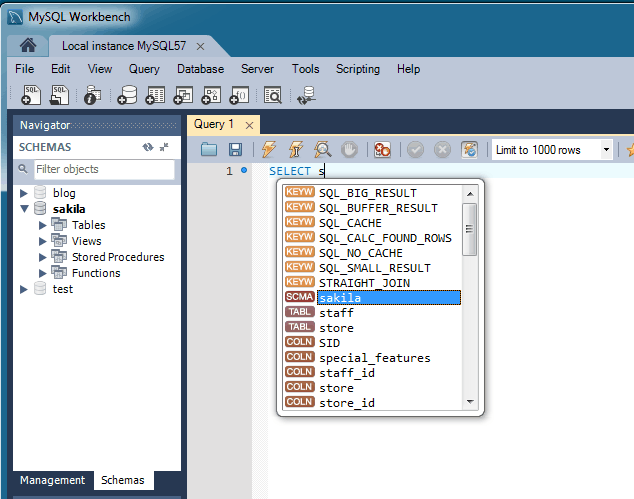 This section summarizes many of the new features added to MySQL Workbench 6.3, in relation to the MySQL Workbench 6.2 release. Full MySQL 5.7 language support was added, which affects grammar, syntax highlighting, preferences, behavior, and more. The bundled sakila_full.mwb model now uses a dedicated 5.7 version to allow for 5.7 specific features, regardless of the version setting in the preferences. The JSON editor was improved with better parsing and error checking. The option to specify an alternative application data directory, instead of the default location, was added. Dropped support for MySQL 5.1. Minimum version is now MySQL 5.5. Dropped Fabric support in MySQL Workbench 6.3.9; support in older versions of MySQL Workbench is unchanged. Dropped support for DBDesigner 4. The home screen was modified: the connections, models, and starters were split into individual pages. A new Log Level preference (under Others) was added to alter the log verbosity level. As before, this can still be set by passing in the log-level command-line argument into Workbench at runtime, and doing so overrides the Log Level setting. Linux: Fedora 23 support dropped, Fedora 25 support added. Oracle Linux 6 support was dropped. Windows: Zip packages and 32-bit binaries are no longer published. The .NET Framework version 4.5 is now required. OS X / macOS: Version 10.7 (Lion) and 10.8 (Mountain Lion) support was dropped. Now supporting versions 10.9 (Mavericks), 10.10 (Yosemite), 10.11 (El Capitan), and 10.12 (Sierra). Changed to GTK 3 on Linux. 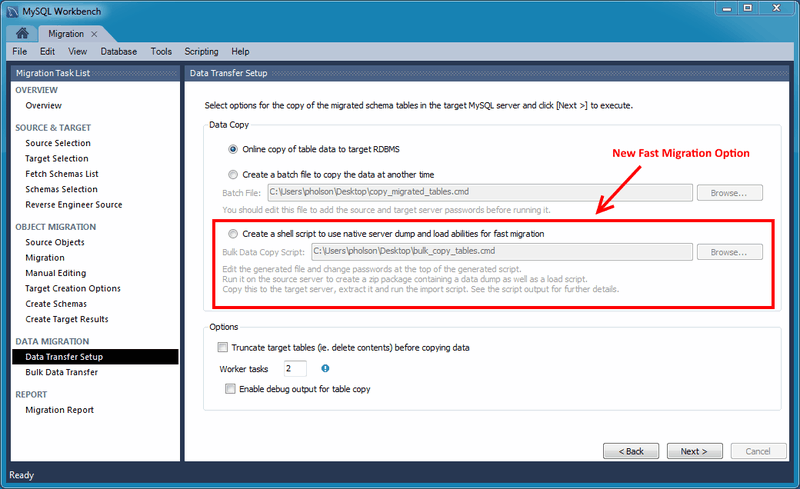 A new "fast migration" option was added to the migration wizard. This is another way to transfer data from one MySQL server to another while performing a migration, and it complements the existing solutions. The premise is to use a generated script on the source server to create a dump that you move to the target machine to perform the import there. This avoids the need to traffic all data through MySQL Workbench, or to have a permanent network connection between the servers. Instead, the dump and restore is performed at maximum speed by using the LOAD DATA call for the MySQL import. The migration wizard automatically creates all necessary scripts for all supported platforms and servers. The generated script creates a self-contained Zip file that must be copied to the target server. You unzip it and execute the provided script to perform the data import. A new SSL certificate generation wizard was added. This new wizard helps create proper SSL certificates for both MySQL clients and MySQL servers. Connections in MySQL Workbench are updated with the certificates by the wizard. This wizard requires OpenSSL to create the certificates. An example my.cnf / my.ini file is also generated that utilizes the generated certificates. For additional details, see Section 5.3.4, “SSL Wizard (Certificates)”. It now functions with all statement types, when before only SELECT statements were fully supported. 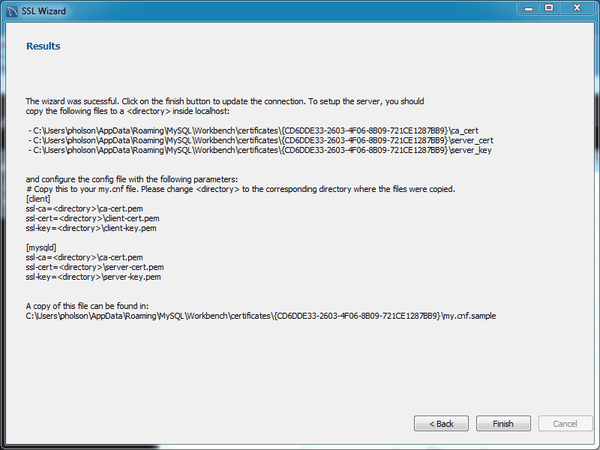 It now minds the MySQL server version. For example, it now only shows the engines available from the server. Additional suggestions are now available, such as system variables, engines, table spaces, logfile groups, and more. New graphics including color coded (and tagged) entries. It is context aware, as for example it only shows available keywords, columns, and tables. Improved MySQL 5.7 syntax support. MySQL Enterprise Firewall support was added in MySQL Workbench 6.3.4. 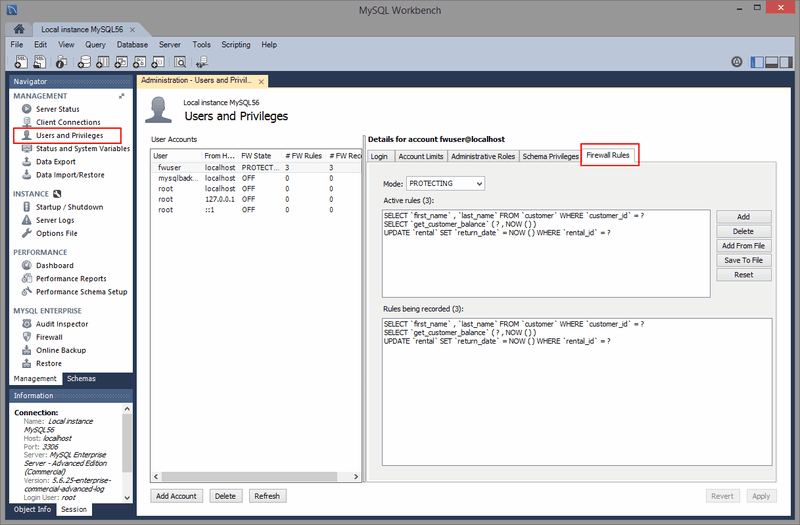 Use MySQL Workbench to install and enable MySQL Enterprise Firewall, and manage the MySQL Enterprise Firewall rules and variables. For additional information, see Section 6.8, “MySQL Enterprise Firewall Interface”. Profile handling now detects mismatches between MySQL Enterprise Backup executables and corresponding profiles. 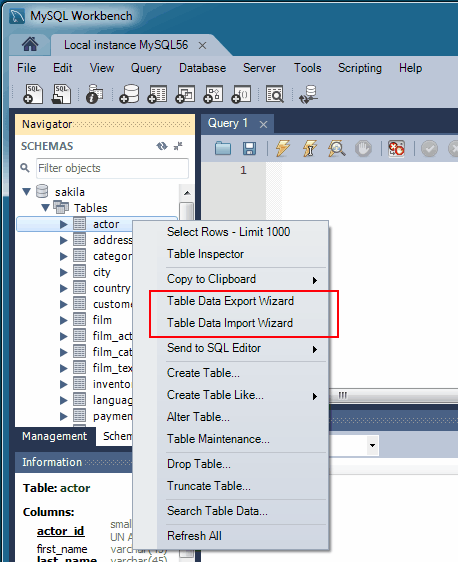 A new table data import/export wizard was added. 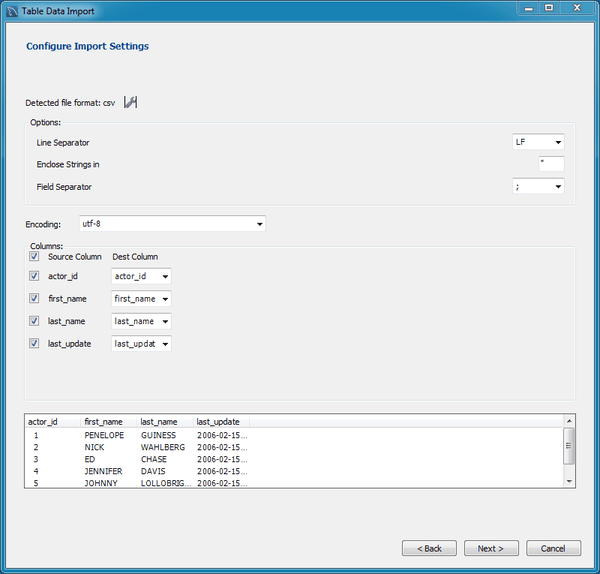 This feature enhances the current CSV import and export feature found in the SQL editor's result set viewer. It supports import and export of CSV and JSON files, and allows a more flexible configuration (separators, column selection, encoding selection, and more). This new wizard does not require an executed statement on a table for a result set to be operated on, as it can now work directly on tables. The wizard can be performed against either a local or remotely connected MySQL server. 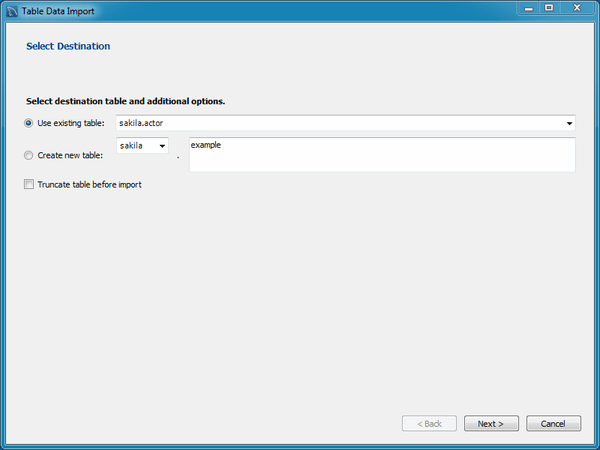 The import action includes table, column, and type mapping. For additional information, see Section 6.5.1, “Table Data Export and Import Wizard”. The wizard is accessible from the object browser's context menu. MySQL Fabric 1.5 is now supported. Older versions of Fabric are no longer supported due to incompatible protocol changes. OS X / macOS builds were switched from 32-bit to 64-bit. Platforms support changes: 6.3.0: Fedora 21 and Ubuntu 14.10 support was added, Ubuntu 12.10 support was dropped. 6.3.4: Fedora 22 and Ubuntu 15.04 support was added, Ubuntu 14.10 support was dropped.